A gentle and relaxed holiday destination, Lamu is Kenya's oldest inhabited town and the unhurried way of life has changed little over the centuries. 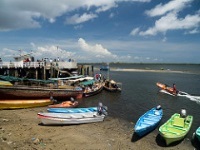 Part of the Lamu Archipelago, Lamu town (on Lamu Island) is reached by boat from the mainland. The narrow, winding streets are crowded with pedestrians, markets, vendors and donkeys. Lamu's lovely old Arab houses feature intricately carved doors and lintels, and mosques decorate the streets of one of the last remaining Swahili towns from a civilisation that used to be the cultural force along the coast. A dhow trip is a mandatory holiday outing and sailing around the little islands or to the beautiful beaches is a memorable experience. There are plenty of tour guides ready to show tourists around the archipelago by dhow, and visitors can find them along the seafront by looking for the bright blue shirts of the Promise/Ahadi organisation. The Takwa ruins on Manda Island and ancient settlements on Pate are great attractions to visit. Shela Beach, on the north end of Lamu island, is a beautiful white sand beach popular for sunbathing and watersports. For a sense of local history and Swahili culture, visitors can explore the Lamu Museum, the Swahili House Museum, or Lamu Fort.